Columbia, SC: Shotwell Publishing, 2017. ​When the Yankees Come: Former South Carolina Slaves Remember Sherman's Invasion. Columbia, SC: Shotwell Publishing, 2016. ​Ending slavery, contrary to self-congratulatory American myth, was not a righteous crusade. It was a by-product of a brutal war of conquest and invasion—a total war against civilians in which black Southerners suffered as much if not more than whites. The devastation of the people’s resources in large areas of the South left African Americans as well as Southern whites suffering and sometimes starving. For many, it was an experience of fear, disruption of life, and cruel uncertainty about their future, to which the liberators had given no thought. Understanding the War Between the States by 16 Southern Historians. Eds. Howard White and Clyde Wilson. Charlotte, NC: Society of Independent Southern Historians, 2015. ​Understanding the War Between the States is a supplemental booklet by 16 writers that enables a more complete and truthful study of American history among young but diligent and inquisitive students. . . . Consisting of 40 concise chapters, beginning with the Colonial era of North America, moving to the Revolution and the establishment of the United States of America, it proceeds into westward expansion to the Pacific Ocean. . . [A]t that point in American history the northern cultures and southern cultures clash in a horrific political sectional contest over how powerful should be the country's Federal Government. The consequence is political sectionalism in the Northern States, giving rise to the Republican Party and the election of Abraham Lincoln and Republican governors throughout the Northern states. Secession of 7 southern states takes place, President Lincoln contrives a pretext for launching a war of subjugation and conquest against the non-Republican southern States. After 4 years of horrific war, even "total war." the Federals prevail. A process of political reconstruction ensues, a process for the Federal Government to become all-powerful is launched and the limited government promised by the American Revolution is lost to memory. State Rights declines into a faint memory of days long ago, everywhere, North South and West. 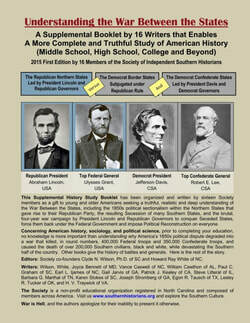 In only 88 pages (8 1/2 x 11), The Society of Independent Southern Historians has produced the most concise, complete and readable history that has ever been created for the purpose of imparting a truthful understanding of the War Between the States.